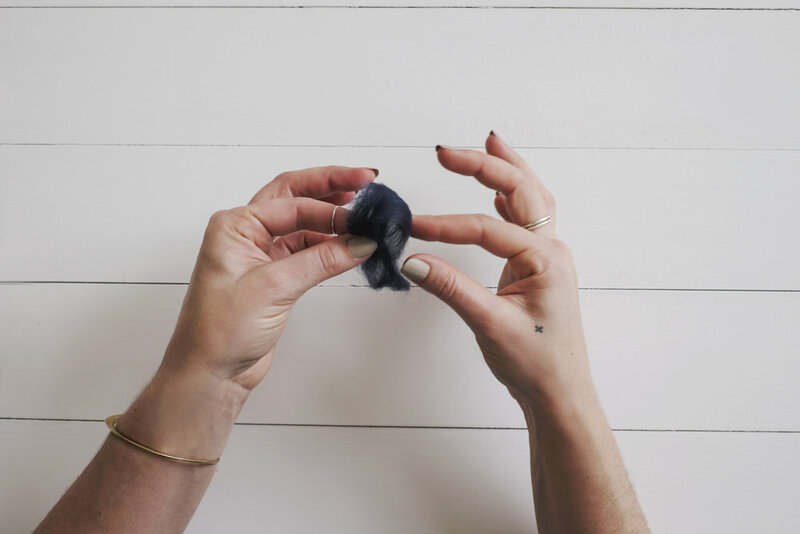 When we approached knitter and pattern writer, Lindsay Bach, about developing a slipper knit kit, her mind immediately went to a technique called thrumming. Developed in some of the colder regions of the world (Newfoundland and Labrador) it is perfect for a snuggly and warm knit kit. For this technique, roving is used to create small figure eights that are incorporated into the knit structure so that the inside of the knit has a fluffy cloud of roving against your skin, and the outside of the knitting has a sweet heart shaped pattern throughout. Traditionally found in hats, mittens, and slippers, this technique is a favorite because of its warm, soft, sweetness. We were completely sold. To take a little bit of the guesswork out of creating the thrums, we decided to put together this photo tutorial showing how to make them. Whether you are embarking on our Cloud Slipper Knit Kit, or starting any other thrumming project, we hope you find this helpful! If you have your own favorite technique or questions about this one, leave us a note in the comments! Note: Always rip, never cut fibers. 1. Rip off a section of the roving about 6-8 inches long. 2. Pull this apart into four or five lengths. 3. 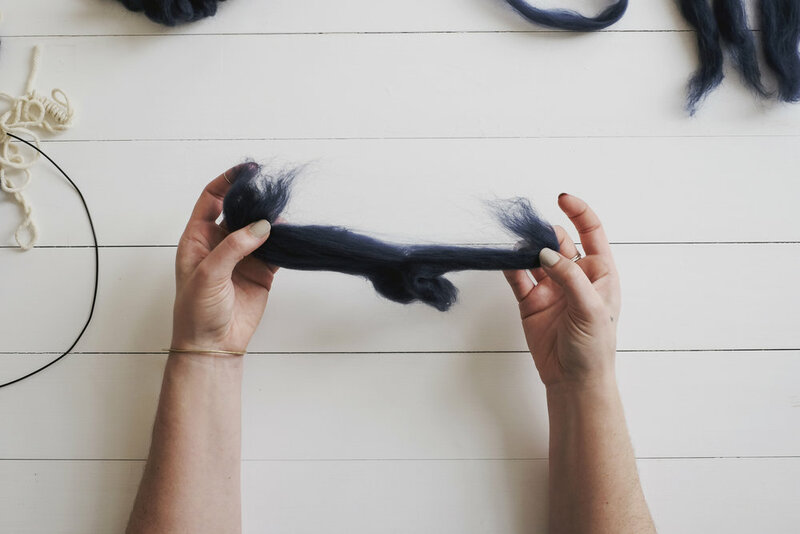 With each of your four or five lengths of roving, draw out the fibers a bit without breaking them. This will elongate the section of roving quite a bit, while fluffing out the fibers! Try to keep your piece as even as possible, running back over it with your hands to find and gently pull out any clumps. 4. Pull off a section about 5-6 inch long and form it into a loop. 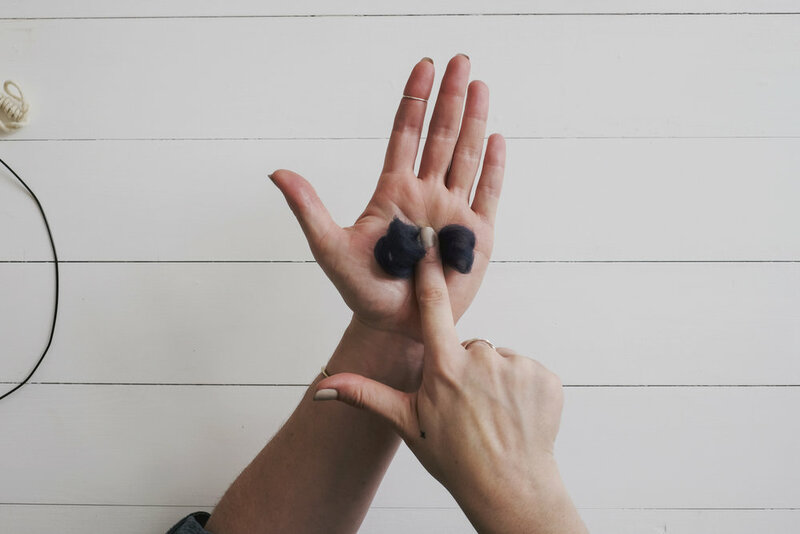 You can measure quickly by wrapping the length around 3 or 4 of your fingers and forming the loop loosely on your hands. Once you break off the fiber, smooth the ends into the loop. 5. Pinch the ends together into the center to form a figure eight. 6. Press the loop against the palm of your hand. 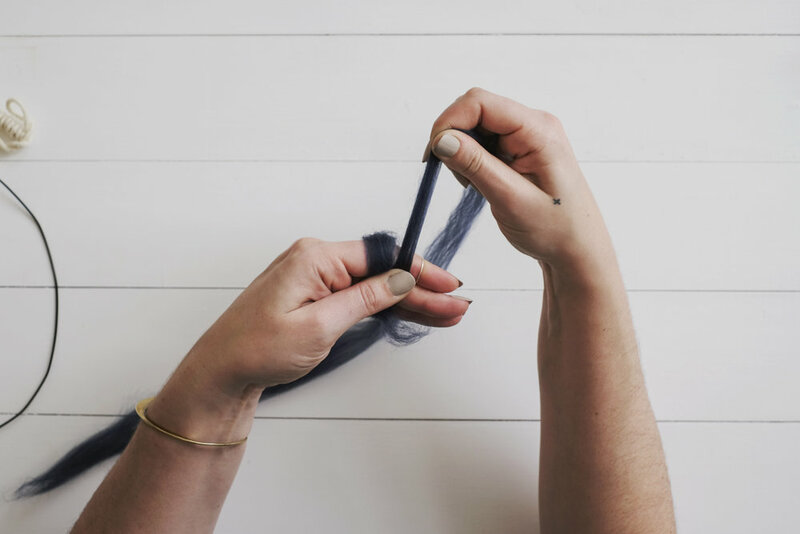 Using your finger, or the blade of your opposite hand, roll the fiber in the center of the loop to felt the fibers slightly. Finished thrums are approximately 3 inches long and roughly the same gauge as the yarn. Make big pile of thrums before you start knitting! 1. Insert the right needle into the stitch below on the left needle. 2. Fold a thrum over the needle and pull it through as a loop, leaving the ends on the wrong side. 3. Knit the stitch above the thrum. 5. Tug on the ends of the thrum to secure it in place. The thrum is now secured into your knitting. Be sure the ends of the thrum are on the wrong side (inside) of the work. Now, go get cozy and start knitting!